I was looking forward to this section of the review, going on my past experiences with DFI's range of boards and a few snippets I'd read on the web before being given a chance to review this board. As usual, I started with a low voltage test. Sticking to approximately 1.35v (+240Mv BIOS setting), I increased the FSB until the chip became unstable. 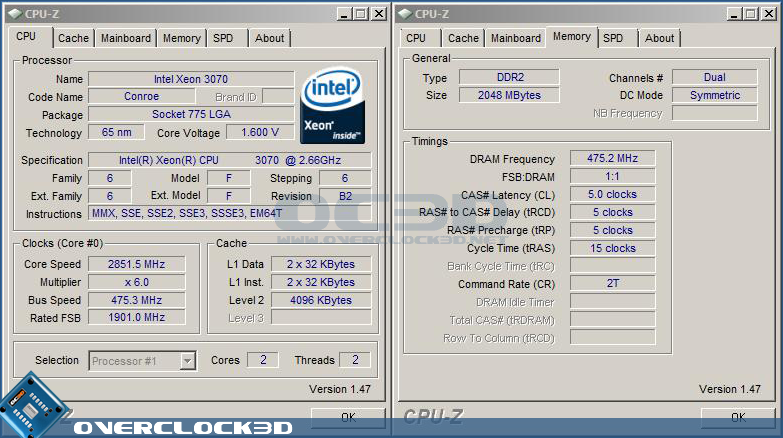 I wasn't too surprised to find this maxing out at 3600MHz (3.6ghz), as this is the sweet spot for my veteran chip. Showing it was capable of maxing out the chip on a low voltage setting, I continued to bump the Vcore up to around 1.6v (+450Mv BIOS setting) and went for even higher. 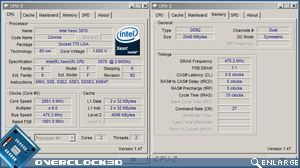 A fair bit of tweaking later and the T2RS managed an reasonable 3900MHz (3.9GHz). Now this is not a blistering speed by any means as I've seen the chip do 4GHz, and likened to the 45nm Wolfdales it's pretty average. I felt that the main issue was due to temperatures and that the board was capable of more but would require better cooling and a lot more tweaking time. The next test was, of course, a maximum FSB test. Leaving the voltage high, jacking up a few more settings and fiddling with GTL settings lead to a maximum bootable and stable FSB of 475Mhz. Overall, the T2RS is not going to be the stem of any record breaking overclocks based on what can be seen here, but it's perfectly capable of putting out some very reasonable speeds. I felt that the board would be much better suited toward a user who would spend a few hours tweaking to seek out the sweet spot for their chip between clock speed and voltage, then run at said settings until the next upgrade.